If your business is experiencing high levels of spam email, and you are considering the implementation of a solution to address the issue, it is recommended that you conduct a hosted anti-spam comparison to ensure optimal spam detection rates and maximum protection against email-borne threats. A comparison of hosted spam filtering solutions – “hosted” meaning cloud-based, rather than those that are hardware or software-based – does not have to be a complicated process. Despite the number of hosted anti-spam solutions on the market, eliminating those that lack certain features can make the task a lot easier. This article identifies several features that should be considered in any hosted anti-spam comparison, but “ease of use” is a must. If an anti-spam filter is too complicated to manage, the consequence will be that the filter´s parameters may be set too low or too high, with the result that spam email continues to flow through your network or the filter prevents the delivery of genuine emails (“false positives”). One of the most important considerations in a comparison of hosted spam filtering solutions is greylisting. Most email service providers (Outlook, Yahoo, Gmail, etc.) have similar front-end tests to identify spam emails from known sources. The tests check inbound emails against Realtime Blacklists, Sender Policy Frameworks and SMTP Controls. What greylisting does is identify spam email from previously unknown sources. As an additional front-end test, the greylisting process returns each incoming email to its originating server with a request for the email to be resent. The significance of the request is that spammers´ servers are too busy sending out spam emails to respond. The request is unanswered by the spammers´ servers and the spam email is never returned. This process significantly reduces the volume of spam email entering the filter so genuine emails are delivered without delay. Another feature to look for in a comparison of hosted spam filtering solutions is outgoing scanning. The outgoing scanning feature scans all the emails leaving your business´s mail servers to detect any that might be interpreted as spam by an over-zealous email filter, or that might contain a link or attachment containing malicious software (“malware”). This can happen quite innocently or be due to an employee preparing a file on their infected home computer and attaching it to a work-related email. The consequence of outgoing email being identified as spam – or found to contain malware – is that your business´s IP address could be added to a Realtime Blacklist and your corporate email account classified as a source of spam. Although the process can be reversed by notifying a blacklisting agency, it can take time to resolve – during which your employees will have to use new accounts with email service providers (i.e. yourbusinessname@gmail.com) in order to communicate with your clients. A hosted anti-spam comparison should not only concern the spam detection capabilities of the solutions you are comparing. Many solutions lack the necessary anti-virus software to protect against phishing attacks and malicious URLs. You should eliminate from your comparison any anti-spam filters that do not have “URIBL” and “SURBL” protocols in their anti-virus software in order to mitigate the risk of fraud and theft. It often only takes one click of a malicious URL to compromise an entire network. “URIBL” and “SURBL” protocols compare links contained within emails and their attachments against a global blacklist of domain names that appear frequently in unsolicited emails. The global blacklist also contains domain names for websites likely to be harboring malware or hiding their true identity behind a proxy server. Regardless of how well you educate your employees on identifying potentially unsafe URLs in emails, it is wiser not to have the emails delivered at all. 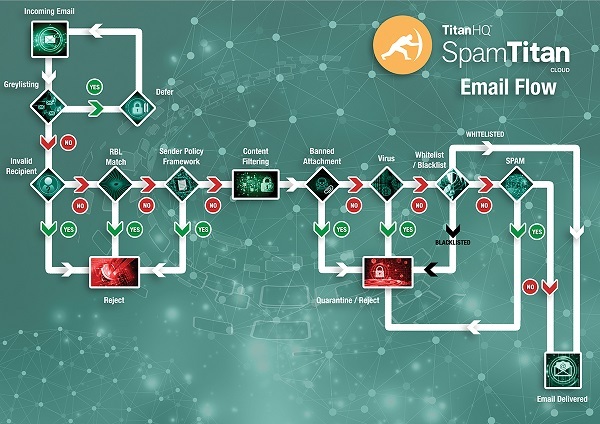 Ideally, a hosted anti-spam comparison should include SpamTitan – an effective email filtering solution from WebTitan that has a spam email detection rate of 99.97%. SpamTitan includes Greylisting among its front-end tests to identify spam from previously unknown sources, scans all outgoing emails to protect your IP address, and has dual Antivirus software with phishing protection and malicious URL detection provided by top-rated Bitdefender and ClamAV. SpamTitan Cloud – our hosted anti-spam solution – is easy to implement and configure. Because the solution is cloud-based, implementation requires a simple redirection of your DNS settings. There is no hardware to buy or software to install. Updates are performed automatically, while configuration of the solution is conducted via a web-based portal with an intuitive interface. You also have the choice of how and when you want reports produced and delivered. 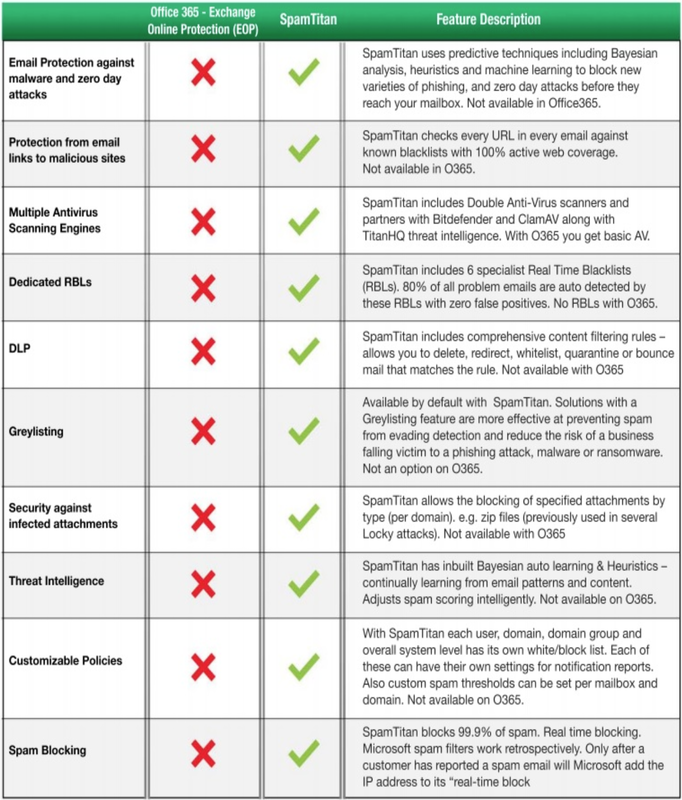 Other features that justify SpamTitan Cloud´s inclusion in any hosted anti-spam comparison are that the solution is universally compatible and scalable. SpamTitan Cloud works on every type of operating system with no limit on the number of users it can protect from spam email and email-borne threats. For larger organizations, we offer a choice of hosting options; and, for MSPs and resellers, SpamTitan Cloud is also available in a white label format. Effective solution for preventing spam. Quick to implement with genuine ease of use. Option to greylist inbound emails. Dual anti-virus plus “URIBL” and “SURBL” protocols. Choice of hosting options and white label availability. SpamTitan has an independently verified spam detection rate of 99.97%. This is achieved through the use of advanced spam detection mechanisms such as SURBL filtering, Bayesian analysis, machine learning, and greylisting. To ensure phishing emails are detected, SpamTitan uses a variety of malicious URL detection mechanisms and dual anti-virus software engines are used to detect and block malware threats. The result is enhanced spam detection and more reliable blocking of spam, phishing emails, zero-day attacks, and new malware and ransomware threats. Prior to concluding a comparison of hosted spam filtering solutions, you should be given the opportunity to test the claims of anti-spam vendors in your own environment. In this respect we offer a free trial of SpamTitan Cloud, with no set up costs, no contracts to sign, no credit cards required, and no commitment to continue with our service once the trial period has finished. You can test our cloud-based solution or gateway offering, the latter being the most powerful and best spam filter for business use for maximum protection. 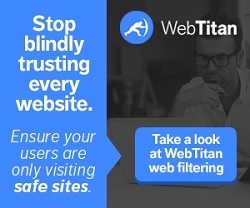 We believe that, within the free trial period, you will be able to implement the optimal filter settings for your business´s specific circumstances and have ample opportunity to witness how effective SpamTitan Cloud is at detecting spam email and blocking email-borne threats. Thereafter, if you choose to continue with our service, we can offer a choice of flexible and competitive payment options. For more information about any of the points raised in the above hosted anti-spam comparison article, to find out more about SpamTitan Cloud, or to start your free trial of our hosted spam filtering solution, do not hesitate to contact us today. Our team of experienced Sales Technicians will be happy to help ensure that your business benefits from optimal spam detection rates and protection against email-borne threats.